MADRID, Nov 18 (Reuters) - Spanish lawmakers on Tuesday urged their government to recognize Palestine as a state, albeit only when the Palestinians and Israel negotiate a solution to their long-standing conflict. The symbolic motion, which echoes similar votes last month in Britain and Ireland, was backed by all the political groupings in the lower house after the ruling People's Party (PP) watered down the wording hours after an attack in Jerusalem. Two Palestinians armed with a meat cleaver and a gun burst into a synagogue and killed four Jews at prayer before being shot dead. The non-binding text brought by the opposition Socialists was initially an outright call to recognize a Palestinian state and had angered the Israeli government. But Beatriz Rodriguez-Salmones of the PP, which holds an absolute majority in the lower house, told the debate her party would not back a unilateral recognition of the Palestinian state "at a time of intense pain for Israel." "It is not the right time to seek a unilateral recognition. Peace and a peaceful cohabitation between two states are the objective ... The method is a negotiation between the two," she said. The text that was adopted said: "The parliament urges the government to recognize Palestine as a state ... This recognition should be the consequence of a process negotiated between the parties that guarantees peace and security for both, the respect of the rights of the citizens and regional stability." 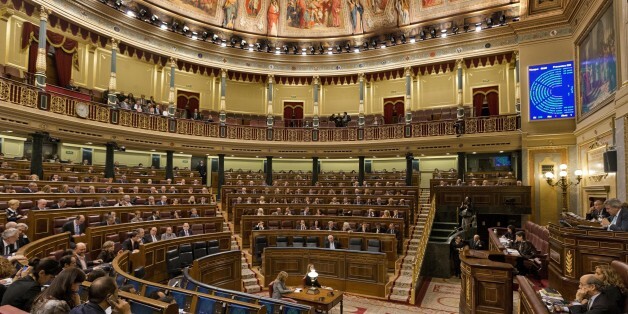 Foreign Minister Jose Manuel Garcia-Margallo, the only member of the Spanish government to attend the debate, said the government was now committed to working in favor of a dialog between the two parties that brought "peace, stability and progress to a region that has been suffering for a long time." He also called on the European Union to have a coordinated approach on the issue. France is eyeing its own non-binding resolution this month after Sweden's center-left government took the lead by officially recognizing the state of Palestine within days of taking office last month. The moves reflect mounting frustration in the EU at Israel's expanding settlement program on land the Palestinians want for a state following the collapse of U.S.-sponsored peace talks. The EU's new foreign policy chief, Federica Mogherini, said the bloc's 28 foreign ministers discussed on Monday how they could start "a positive process with the Israelis and Palestinians to relaunch a peace process." CORRECTION: A previous photo in this article showed the Catalan parliament instead of the Spanish parliament.